Another #CMAD draws to a close with community managers around the globe enjoying a day of celebration. Here at HootSuite, we had a blast linking up with My Community Manager to host a 12 hour Community Manager Appreciation Day Hangout. 86 panelists from seven countries across twelve industries shared their expertise through the 12 hours of panels. The Owls here at HootSuite HQ loved meeting, rubbing elbows and swapping stories with so many amazing community managers around the globe. The 12 Hangouts are sorted into three themes: building a community, engaging your communities and finally, industry-focused community discussion. With that, lets recap the first theme of community manager appreciation day: building community. It takes certain skills to build community through different departments in any large company. The HootSuite owls are especially savvy at navigating this tricky landscape. Learn how HootSuite, GetSatisfaction and Telligent cultivate a powerful internal cultures and communities throughout their companies. How do you remove fear from other departments about community building? How do you align goals between different departments? At what point should you create unique social presences for different departments? What are the challenges of building communities around departments with different goals and priorities? How can you apply community building tactics and tools to help other departments meet their goals? How does cross departmental communication occur without being overwhelmed with frequent meetings (editorial calendar, etc.)? How do you prioritize the needs of other departments (product releases, service updates, content) to slot them into various social schedules? Content is a key responsibility for community managers. Learn the art of curating great content from the bright minds behind some of the newest curation tools in the social-tech-sphere. Why is curating content mean for you and building your community? What are your best practices on how to curate content? How do you determine what content is “on brand” and when to take creative license? What’s your position on sharing company content vs. non-company content? What’s the ratio of branded / company content to sharing other peoples content? Are people consuming too much content these days? How can people cut through the “noise” and find valuable resources for content? Chances are, you use something that Google has developed at least once a day. Whether it’s search, Gmail, AdWords, Google+ or YouTube, Google dominates our online activity. In this panel, they’re going to tell us how it’s done. What is Google’s approach to community? Does it vary across departments/products? How Does Google integrate community into its marketing efforts? How do you inspire people to get involved in your communities? What role does company culture play? To what extent does Google use crowdsourcing? Do you have any particular projects or examples? How do you approach creating a local community vs. creating community globally? What challenges do you face? Learn how to effectively streamline your social enterprise by establishing internal communities. Led by Maria Ogneva of Yammer, she’s talking with the people who have worked to establish successful internal communities at various organizations. Ashley Gross, Rural Sourcing, Inc.
Where should a company start in terms of establishing an internal community? What are some of the most important steps? What are some of the biggest obstacles in terms of establishing an internal community? How do you overcome initial hesitations? How can having an internal community reduce email? What are the benefits? How do you ensure culture and vision stays in tune with your goals when your company scales? How can you build out customer communities? Part two of the #CMAD panels specializes in engaging your communities. 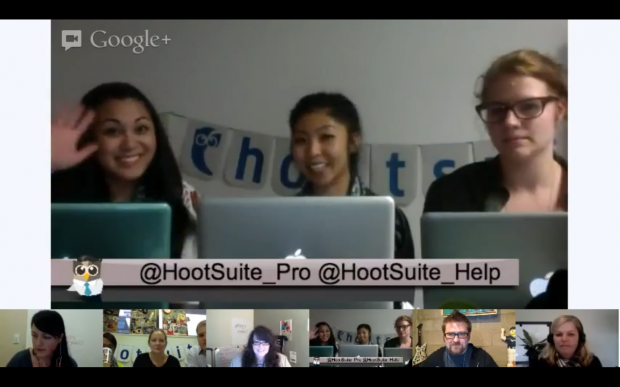 Watch the HootSuite blog for more info on this coming recap. Which panel of these four did you most enjoy? Leave a comment and let the Owls know!